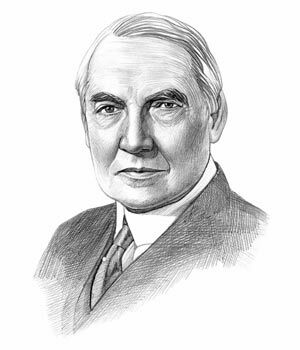 Definition and Summary: Warren Harding, a Republican from Ohio, assumed the presidency on March 4, 1921 after a successful campaign promising a "Return to Normalcy" following the rigors of WW1. 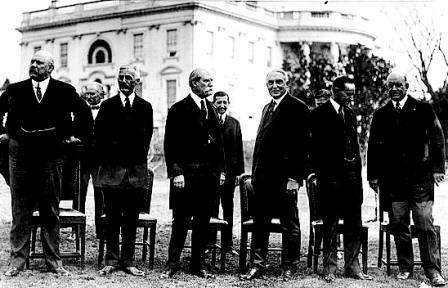 President Harding was easy-going, charming and relaxed but lacked confidence and surrounded himself with friends and political allies from Ohio - the group were given the nickname of the "Ohio Gang". Members of the Ohio Gang were given powerful positions in the Harding administration, including positions in the cabinet. The financial and political scandals caused by men in the "Ohio Gang", notably the "Teapot Dome Scandal" shocked the nation and severely tarnished the reputation of President Warren Harding. Powerful members of the Ohio Gang included Harry M. Daugherty, Albert B. Fall, Will H. Hays, Charles R. Forbes and Jess Smith. Investigations following the unexpected death of the president in 1923 led to convictions for fraud, conspiracy, and bribery. Warren Harding was the 29th American President who served in office from March 4, 1921 to August 2, 1923. One of the important events during his presidency was the Ohio Gang. "No rumor could have exceeded the reality; the study was filled with cronies, the air heavy with tobacco smoke, trays with bottles containing every imaginable brand of whiskey stood about, cards and poker chips ready at hand - a general atmosphere of waist-coat unbuttoned, feet on the desk, and the spittoon alongside." The following fact sheet contains interesting facts and information on Ohio Gang for kids. The following fact sheet continues with facts about individual members of the "Ohio Gang" for kids. Ohio Gang Fact 9: Harry M. Daugherty: Harding's campaign manager, Harry M. Daugherty (1860-1941), was appointed to the Cabinet as US Attorney General. Daugherty became involved in the illegal sale of Presidential pardons and liquor permits but was acquitted when he was sent to trial. Ohio Gang Fact 10: Albert B. Fall: Albert B. Fall (1861-1944), Senator of New Mexico, was appointed to the Cabinet as Secretary of the Interior. Albert B. Fall receive "loans" (bribes) to lease land in Teapot Dome, Wyoming, and Elk Hills, California, to oilmen Harry F. Sinclair and Edward L. Doheny. He was fined $100,000 and served a year in jail refer to the Teapot Dome Scandal. Ohio Gang Fact 11: Edwin C. Denby: Edwin C. Denby (1870-1929) was appointed to the Cabinet as Secretary of the Navy and played a notable, corrupt role in the Teapot Dome scandal, leasing oilfields to friends in exchange for bribes. Ohio Gang Fact 12: Charles R. Forbes: Charles R. Forbes (1878-1952) was appointed to head the Veterans Bureau and became involved with corrupt financial dealings with a number of contractors. He was convicted for bribery and corruption, and fined $10,000 and sentenced to 2 years in Leavenworth. Forbes involved Charles Cramer, the general lawyer for the Veterans Bureau, in his unscrupulous deals. One the scandal erupted Cramer committed suicide, shooting himself in the head. Ohio Gang Fact 13: Daniel Crissinger: Daniel Crissinger (1860-1942) was a boyhood friend of the president and member of the Ohio Gang was appointed chairman of the Federal Reserve Board, even though he was not qualified for the job which gave him power over the Federal Reserve. Ohio Gang Fact 14: Thomas W. Miller: Thomas W. Miller (1886-1973) was appointed Custodian of the Office of Alien Property, which handled property seized during WW1. He became involved in the sale of the American Metal Company, whose assets were seized during WW1, to German metal magnate Richard Merton. This led to charges of conspiracy to defraud the government and was sentenced to 18 months in prison and a $5,000 fine. Ohio Gang Fact 15: Jesse Smith: Jesse Smith (1871-1923) was an aide to Harry Daugherty as Attorney General at the Department of Justice. He was implicated in the financial scandals of the administration and was exposed as a "bagman" carrying bribes to and from the Attorney General's office. Jesse Smith was indicted on charges of conspiracy to defraud the government but committed suicide before his case came to trial. Ohio Gang Fact 16: Charles "Doc" Sawyer: Charles "Doc" Sawyer was from Marion, Ohio and was appointed as White House physician and was a close confidante of President Harding and a member of the Ohio Gang. Ohio Gang Fact 17: Frank Edgar Scobey: Ed Scobey (1866–1931), former Sheriff of Pickaway County, Ohio, became Director of the United States Mint but was not directly implicated in the scandals surrounding the Ohio Gang. Ohio Gang Fact 18: Gaston Means: Gaston Means (1879-1938) was a distinctly shady associate of the Ohio Gang. He was hired by by his friend, Attorney General Harry Daugherty to work in the Department of Justice. Gaston Means had nemerous underworld contacts that he had developed during his years as a detective. Many were now bootleggers during the Prohibition era. Means was indicted for larceny, conspiracy and nearly one hundred violations of the Prohibition Act and was sentenced to 2 years in jail to which another 2 years were added in subsequent trials. The article on the Ohio Gang provides detailed facts and a summary of one of the important events during his presidential term in office. The following Warren Harding video will give you additional important facts and dates about the political events experienced by the 29th American President whose presidency spanned from March 4, 1921 to August 2, 1923.